Whether we are willing to admit it or not, I think perhaps most of us, at some point in time, have ruined a drum. With some, it was long before it was vintage. The need to make something playable, to fix something that was broken, to add something we needed at the time. Adding a mount, but not bothering to sufficiently plan out its placement, and in so doing created something that not only did not work, but, by its very nature, put an undue burden on the set. Changing mounts with “other” parts, drilling extra holes, making changes that for the moment, made the drum usable. However, at the same time, marring a beautiful drum with ugliness. My story starts back in 2002. I had been reading how that Big R Dyna-Sonic snare drums were “inferior” to anything produced previously. Especially so when compared with anything from the Cleveland/Dayton eras. A thing which, I discovered over time, to be meaningless rhetoric for the most part. “Different” and “not exactly the same” does not necessarily translate to inferior. I owned a 1977 Big R Dyna-Sonic, and decided to purchase a 60s era drum so I could find out for myself. I ended up with two. Dyna-Sonic number 10407 I purchased from Kelly Smith. This is a seven line COB 5x14. The second was Dyna-Sonic number 13723, which came to me as a bare shell, for which I paid $25.00. My main interest in it at the time I bought it was weight comparison to the 1977 drum I have owned for most of my life. I found very little difference in the two shells. They weighed almost the same. 13723 was a decent shell, no major markings, no dents, just a decent bare shell needing a good cleaning. And that, is where things went badly. At the time I had no experience with restoration, nor with real cleaning. I did not have a clue as to safe methods, or what would constitute proper cleaning for the drum. I followed advice I had seen online. I seen recommendations for 4-0 Steel Wool, and how well it cleaned and polished chrome. Those making those postings seemed to be rather well respected, and the results claimed to be good, so I gave it a go. 0000 steel wool with a bit of dish soap and water. Now, I got to tell you, before the drum was dry, I was sick to my stomach. I knew I had made a mistake. The shell looked better before than after. From a few feet, it was fine. Indoors it was fine. Under direct lighting, or outdoors, oh man, did it ever show. I picked up the parts to put the drum together, different eras, no regard for correct period parts, since it did not really matter, and the drum was of little to no value anyway. In 2006, I purchased a 1964 Wine-Red Ripple Pearl 20-12-16 set from Ebay, and made an additional purchase from the seller which included a five line 6.5 Dyna-Sonic with good hardware, albeit a broken shell, also the original hardware package for the set. Dyna-Sonic number 12938 was completely dented. Everywhere. Like rolling down the stairs dented. With breaks in the shell. All of the hardware on this drum was transferred over to 13723. Giving it something much closer to period correct parts, and making it a more complete drum. The scratches bothered me. I routinely cursed steel wool, the advice to use it, and those giving it. I could not play nor look at that drum without knowing the damage to the shell was caused by me, and me alone. In the past 15 years it has never happened to another drum in my possession. I often come across 4-0 steel wool as a cleaning recommendation for musical chrome. I fight it. I speak against it. And I have gone out of my way to prevent it happening to other drums. I have been told, I did it wrong. I pressed too hard, and that “so and so” recommends it. I, however, do not recommend it. In fact, there are at least a dozen other methods for cleaning that are not abrasive in the least, that yield very good … far better...results, and will never harm a chrome drum. Those I recommend. Only those. Dawn dish soap and water gets highly recommended as an excellent, non-invasive cleaning method that routinely is my first choice with breaking down a drum for cleaning. Never steel wool. Never an abrasive polish. Over the years I have discovered the least invasive method is the best first method, and the most invasive method, is the one best not followed, ever. I am and will always be, against the use of steel wool. Always. As for “I did it wrong”..... 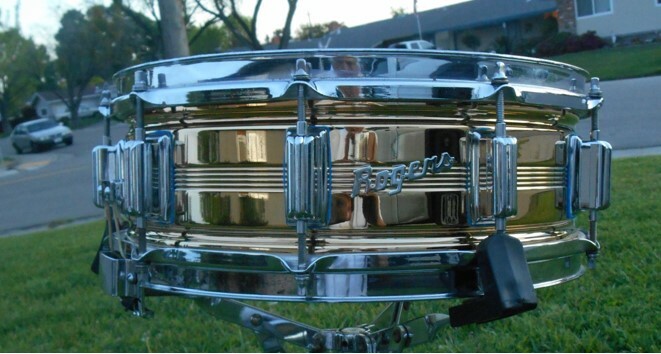 I have this 5x14 SuperTen COS shell that has some missing chrome. It has been my practice shell for many years. I have pounded dents into it to take them out. I have used it to test polishes and methods. Each of the ten panels between the lugs has been subjected to some form of abuse, except for the one I kept original. You cannot undo the damage caused by steel wool. Those micro scratches might not be visible indoors... however, get the lighting right, and you can know this chrome was abused and that chrome was not. I did a couple of stand bases a few years back, one with Never Dull and a lot of work, the other with 4-0 and polish. They both cleaned up. Both were severely rusted through the chrome. The cleaned chrome on the Never Dull base looked better than the cleaned chrome of the steel wool base. Just don't. There are regrets one should not live with, ever. In the past fifteen years, I have played 13723 along with the other Rogers drums I own, but never with the same degree of pride and enjoyment as the others. There has always been this shadow of shame I felt because of what I did in following bad advice. Don't do things to drums just because someone recommends it, or claims to do it, or has good results with it. Take the time to find out if the advice is good or bad before proceeding. Because, you, really cannot un-ring a bell. In the spring of this year, my good friend Jeff Burke, of the Rogers Drums USA Facebook Group, had me send this drum to him. So the shell got stripped down, I pulled the badge, boxed it up and off it went to Friendswood Texas. Several weeks later it came back... and I am forever in his debt. This drum, Dyna-Sonic number 13723 is living its new life as The Ploughman. It once again, for a time wears its original badge, but soon, it will have a new custom made Dyna-Sonic badge on the outside, and the original will be placed inside the drum. This 24K Gold Plated Dyna-Sonic Tribute #2 “The Ploughman” has that distinctive Dyna-Sonic sound, but the note is now slightly darker. The voice is deeper. The same responsiveness, articulation, and pure joy of the strike is present, but the drum has a slightly deeper more authoritative voice. I am loving it. The journey of this drum is long, and at many points nearly ended in the scrap heap. Today, for all time, it lives, proudly. See, you did not expect a happy ending.